The Wentworth to Broken Hill Pipeline is a major piece of public infrastructure supplying up to 37.4 megalitres of raw water per day via a 270 kilometre pipeline from the River Murray near Wentworth to Broken Hill. An initiative of the NSW State Government, construction began in January 2018 and was completed by the end of that same year. A majority of the buried pipeline runs adjacent to the Silver City Highway, with the last 6 kilometres running under the streets of Broken Hill until reaching the Mica Street Water Treatment Plant. The pipeline requires four pumping stations which were constructed along the route, as well as a 720 megalitre bulk water storage facility 25 kilometres south of Broken Hill. Prior to the pipeline’s construction, Broken Hill and surrounding communities had suffered from significant water shortages. To find a long-term solution, the NSW Government looked at potential options, which are discussed in detail on the Department of Industry website. The Wentworth to Broken Hill Pipeline was identified as the best solution because it would provide the most reliable long-term water supply sourced from the River Murray. In mid-2016 the NSW Government announced to Broken Hill residents that it would build the Wentworth to Broken Hill Pipeline and later appointed WaterNSW to construct it. Following a tender process, a joint venture of John Holland, MPC Group and TRILITY were engaged to design, construct, operate and maintain the pipeline. Over 2300 truckloads were required to deliver the pipes along the pipeline route with 1473 loads from Melbourne and 842 loads from Perth. This project brought immediate benefits to both Wentworth and Broken Hill. Over 150 local people contributed to the pipeline workforce which reached a peak of over 500 workers during construction. Broken Hill and Wentworth based companies supplied almost $50 million in goods and services to the project. 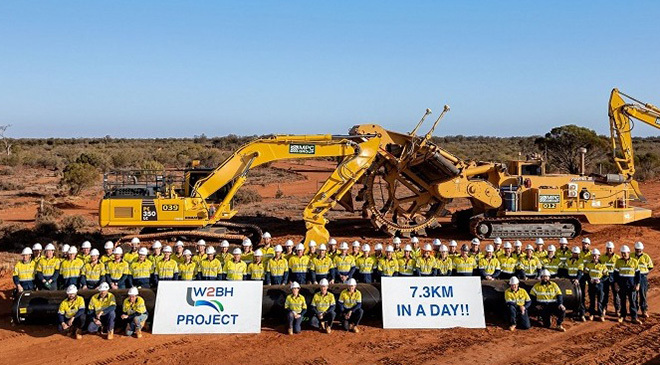 Community initiatives carried out by the W2BH delivery team included work for the Sulphide St Railway and Historical Museum, enhancement of the ET Lamb Memorial Oval, sponsorship of the Broken Hill Community Volunteer Awards and fundraising for local community-run organisations including Silverlea Early Childhood Development. Documents and releases with information about the project.